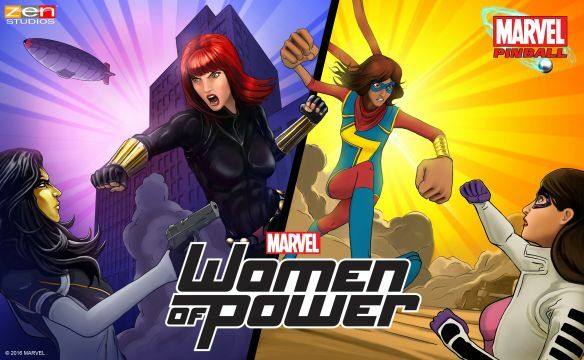 Zen Studios today revealed their latest entry to the Marvel Pinball franchise, Marvel’s Women of Power. Coming to Zen’s pinball platforms on consoles and PC on September 27th, Marvel’s Women of Power pack brings together the mightiest female Super Heroes and Super Villains in the Marvel Universe in two new tables. Combining a plethora of Super Hero ladies from the Marvel Universe, the Marvel’s Women of Power two-pack combines two tables starring Ms. Marvel, Black Widow, Squirrel Girl and more. Wage battle in an alternate Soviet-dominated reality in the A-Force table, featuring an all-new storyline where the destruction of a Cosmic Cube has formed a Soviet-controlled alternate reality. Keep the Cosmic Cube balls alive in the table’s Wizard Mode by directly controlling Black Widow and Madame Masque. In the Champions table, defeat Bombshell with Ms. Marvel in an original storyline where players must help Kamala and her friends as they take on Bombshell following a daring bank robbery. Utilize Squirrel Girl’s “squirrel army” to search for the criminal’s tracks and Spider-Gwen’s webbing to incapacitate your enemies on this table.